Don’t get me wrong, it was piss stupid, but it was the kind of stupid that entertained completely. It’s the kind of movie that’s perfect to watch in a theater with a crowd of people who are equally aware of how stupid the entire thing is. It’s the perfect popcorn movie if you turn your brain off before going into. 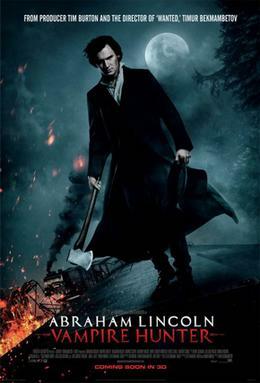 But this is a review, so let’s turn those brains right back on and point out exactly why Abraham Lincoln: Vampire Hunter is such a terrible, terrible movie. First off, the premise. Abraham Lincoln. Vampire Hunter. Do I really need to say more? Honestly though, this was the entire reason I wanted to see this movie. I knew it was going to be stupid, and I was not disappointed. Second, there are so many phenomenally stupid moments in the movie. Such as one particular moment involving a carriage, which I won’t spoil, because it is a glorious moment of stupidity. Third, it isn’t self aware enough. My buddy, who I went with, compared it to Army of Darkness, but said that the movie took itself far too seriously to really match that classic of stupid movies. Fourth, and this will be the longest part of the review, and easily the most damning part of the movie, it has a horribly confused vampire mythos. Abraham’s mother is bitten by a vampire, and then she dies. His son is bitten by a vampire, and then dies. Henry, Abraham’s mentor, is bitten by a vampire and turns into a valmpire himself within seconds. There’s no consistency to what the bite of a vampire does. Does it just kill, or does it turn those bitten into vampires. It would have worked if they had stuck with the standard, person gets bitten, dies, and comes back as a vampire, which would have added a more gruesome aspect to the tragedy of Abraham’s losses. Instead apparently people die, or are turned, whenever it is convenient to the plot. Henry, a vampire, recruits Abraham because he, Henry, as a vampire, cannot kill vampires himself. But that doesn’t stop him from fighting vampires on several occasions. How far does this extend? Can he fight vampires, but not kill them? At what point does this arbitrary rule stop him? Would it keep him from shooting a fellow vampire? Then why does it not stop him from viciously beating another vampire. And why, if a vampire can’t kill other vampires, does he try to get Abraham to become a vampire at the end of the movie? To hunt for all eternity? YOU CAN’T HUNT VAMPIRES IF YOU’RE A VAMPIRE!!! Movie, please, try to remember your own rules. Even a stupid action movie needs to follow its own rules. Silver replaces all other methods of killing vampires. While I’m not a fan of vampire and werewolf mythos being confused, I can accept that silver is an anti-vampire weapon in some situations. But when silver is all you need to kill a vampire it removes the threat of the monster. The point of a vampire is that they’re terrifying because they’re hard to kill. If it’s suddenly so easy that you just need a specific metal that removes the danger. I could go on, there are so many stupid moments in this movie, especially in the climax. But really that would be unfair to those of you who intend to see and laugh at this movie. So I’ll cut it short, with this recommendation. If you must watch it, watch it in a theater, preferably at a cheaper matinee. This is a movie that must be watched with other people. The moment you’re watching it on your own you’re left with just a really stupid movie. So don’t bother buying the DVD when it comes out. And, while you’re still here, ignore my advice to turn off your brain. Keep it on the whole time, the only way to enjoy this movie is to be aware of exactly how stupid it is. Do that, and you’ll have a great time. But really, go at a matinee, otherwise you’ll be too busy mourning the money lost on this stupid, stupid movie. Everybody should watch this movie, but nobody should buy it on DVD.